I’m just back from a whirlwind trip to Kolkata—my hometown, which still feels like a dream. With just three days in hand, I managed to see my ailing parents and spend time with them, attended two wedding receptions and even managed a short catching-up with a few schoolmates. All this happened while I was struggling to deal with a couple of health issues that put me through a lot of pain and anxiety and I had no option but to put myself on a self-imposed ban from every device, which meant no blogging and writing happened all this while. I still have a long way to go on the journey of complete recovery but, I can assure you I will be there back to blogging regularly very soon. For today’s #WordlessWednesday, I thought of sharing one iconic shot, that I’ve been planning to, for a long time. It is a throwback to a beautiful day and a beautiful trip taken last year—the day we went up the famous Table Mountain. This picture speaks for itself—it is a breathtaking view of the ‘Mother City’—Cape Town, from atop the iconic Table Mountain. It was a dream come true when we visited Cape Town last April, and more so, to stand atop this mountain and enjoy this view below. I can only say that It was sort of a once-in-a-lifetime moment for me! 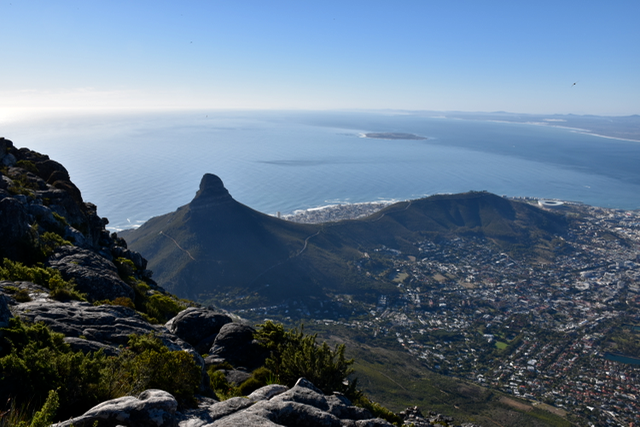 The picture is more of a birds-eye view of the city, with the Lion’s Head in the centre and Robben Island (where Nelson Mandela was kept imprisoned) in the distance, surrounded by the Atlantic Ocean on all four sides. The city spreads out before you like nothing you’ve seen before and the curve of the Earth is something you simply cannot miss. Awe, wonder and disbelief—a few things that I felt rising within me that sunny morning, on top of the Table Mountain. For those who are interested, a detailed post on the trip itself will be up on the blog very soon. Until then, I hope you will enjoy this view. What do you think of the sight? Anything you’ve seen that compares with this? Do feel free to share your thoughts and views in the comments below. Thank you very much, for stopping by the blog today. If you are a blogger and wish to link up with us, please do read the rules below. Joining in is super simple and great fun. The man made is always dwarfed by the God made, was the first thought that rushed to the shore the moment I saw this click. Serene and grand is what I will call this view! Thanks Esha for sharing this. You’re spot on, Anagha! Humans can never compete with the Creator’s power. Truly a grand view and one that we will cherish forever. Thanks for stopping by the blog. The view is fabulous. The sea side looks so peaceful and refreshing. I can understand how it must feel to have one of your dreams come true. Thanks, Rajlakshmi. It was absolutely stunning to see my dream come true in that very moment that we had reached the ‘Table Top.’One of those special experiences, you know. Thank you so much for your wishes, Raj. Hope to be back to writing soon. Wow! So picturesque!! There’s nothing like standing at the top of a mountain and soaking in the panoramic view of the city. It must be truly a surreal and beautiful experience. It sure was, Shilpa! A greater weaver of words might have done a better job of describing the sight than me, but I sure loved the sight of the city from up there. Lovely picture. Hope you are feeling better. Take care. The picture speaks for itself, you said it! I love the view of the city from the top of the table mountain. The view of the wide spread Atlantic Ocean looks beautiful and so is the view of the city down below. I shall be waiting to read your detailed post on Cape Town visit. WHAT HAPPENED??? Are you okay now? Mujhe kyun nahi bataya? How are your parents now? And, everything at home? We really need to get in touch someday soon, Eshu! The shot is terrific no doubt…but, I just want to know what happened with you. Call me when you find time….okay? South Africa continues to be a place I want to visit some day. Beautiful picture Esha. I hope your parents are on the road to recovery. Visiting your home town and managing to squeeze in a visit with old friends is one of the best things! Sending you big happy, healing vibes. And swishing all the health issues, and stressors away from your life. Yes, on some day I feel like a fairy with a magic wand. Lol!!! I'm so glad you still managed to write this post despite the myriad issues you are dealing with. And I'm sure this year will definitely pick up for you in no time, and you will return with vengeance to you writing. Just BELIEVE you CAN and you will! Thank you for sharing this lovely shot. I can't wait to read a detailed post and also thank you for keeping everyone updated on your current status. No pressure, no worries. Please focus on your health and take time to heal. Once you do everything will fall in place. Even blogging. And till then blogging can wait some more. Will speak to you again soon later this week. Sorry for the short call yesterday. Sorry to have missed this! I hope you’re feeling better in the meantime, as well as your parents. It’s wonderful you were able to visit your home town. The photo offers an incredible view. Thanks for sharing it.